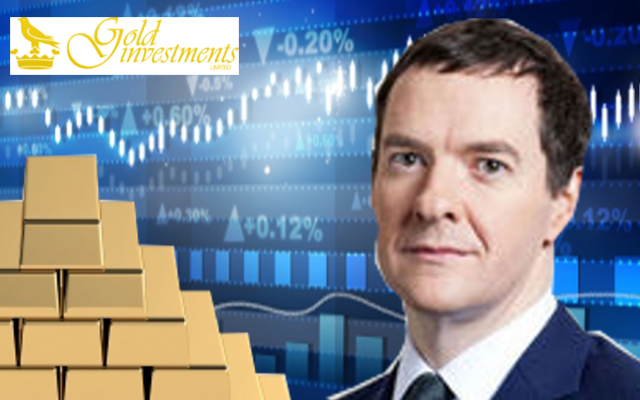 Home / News / Budget 2016 And Economy Forecast: What Will It Mean For Gold? Senior Bullion Dealer, Oliver Temple, sifts through yesterday’s budget and economic forecast to see what the implications for gold investors will be. Pour away that fizzy drinks tax statement from the Chancellor George Osborne in yesterday’s budget, and all state schools becoming academies. Yes, and also discard the announcement about new lifetime ISAs for younger savers. Only then can you start glimpsing the real picture of how the UK’s economy is doing. This is what investors want to know and need to know – particularly those now considering buying physical gold as a way of protecting their assets. In the Autumn Statement, there seemed to be more of a general air of optimism. This was largely fuelled by the government’s forecaster, the Office for Budget Responsibility, increasing its prognosis of how much the Treasury will raise from existing taxes (not new ones) and reducing what it thought the Chancellor would shell out on its massive debts. Roll onto January this year and the Chancellor painted a much bleaker picture. He said the UK faced an economic ‘cocktail of threats’ in 2016. Yesterday, it seemed there was more doom and gloom for the economy; the Chancellor was forced to revise down his growth forecasts. The Chancellor missed his target to get debt falling as a proportion of national income. He is also under fire for his self-imposed cap on welfare spending. Paul Johnson, of the Institute for Fiscal Studies said that Mr Osborne hitting his targets was "only about a 50-50 shot". Mr Johnson said the Chancellor would need to impose "proper" tax rises or spending cuts if there was any further downgrade in public finances. The Chancellor believes that the UK will be back in the black by 2020 as promised but that’s if the economy keeps growing. The UK economy is up against increasing world economic headwinds such as from China’s own slowing economy. There has, however, been some let up for oil prices this week. Crude oil prices are historically linked with gold. OPEC and non-OPEC producers have agreed to hold their next meeting in April on a plan to freeze output. This could potentially affect which commodity investors choose to back. Also good for oil is the falling dollar which helped this week to lift world shares to their highest level of the year. US interest rates being potentially left unchanged could provide guidance for investors although some analysts believe there will be an interest rate rise in September. In the UK, the big Brexit decision and the London Stock Exchange and Deutsche Boerse mega merger could also affect gold prices. The new exchange will create Europe’s biggest securities-markets operator which could be worth more than $30 billion. Gold prices are affected by many different factors. In recent times, the precious metal has not performed as many analysts had predicted. But yet gold is still thought of a safe haven in times of economic difficulty. What we can say looking at this year is that spot gold prices generally have been rising, despite a slight dip at the beginning of this week. It is unclear where the UK and the world economy are heading but it could be prudent for investors to continue spreading their portfolios widely including purchasing the precious metal. Gold should probably be no more than a 10-15% of a portfolio. We would advise investors looking at gold that the precious metal should be regarded as more of a medium to long-term investment and viewed in a similar way to an insurance policy. In other words, there will be fluctuations in the short-term particularly when there are hard to predict economic headwinds. Maybe the Chancellor should look towards building up the UK’s own gold reserves? Gold Investments are one of the UK’s oldest bullion dealers in the UK and are based in the City. Images from Government (Open Use Licence), Boykung and Naypong (freedigitalimages.net).